Xefro has employed the services of European Circuits to design (hardware and software), and manufacture the electronics for its new heating system. Test systems are currently under trial, but Xefro expect this to be the world’s first commercial heating system using the new Graphene material. Jim Broom, Sales Director at Electronic Circuits, commented: “Due to the structure of Graphene it has all sorts of amazing properties – it’s harder than diamond, it’s 200 times stronger than steel, it’s more conductive than copper and because it’s a two-dimensional structure it’s heat transfer properties are instantaneous. “That’s why the guys from Xefro came up with the idea of a graphene coating as the heating element. They came to us last year with the idea to build the existing electronics with a controller. They were some having some issues with the design which we were able to look at and help with in terms of improvement and cost. 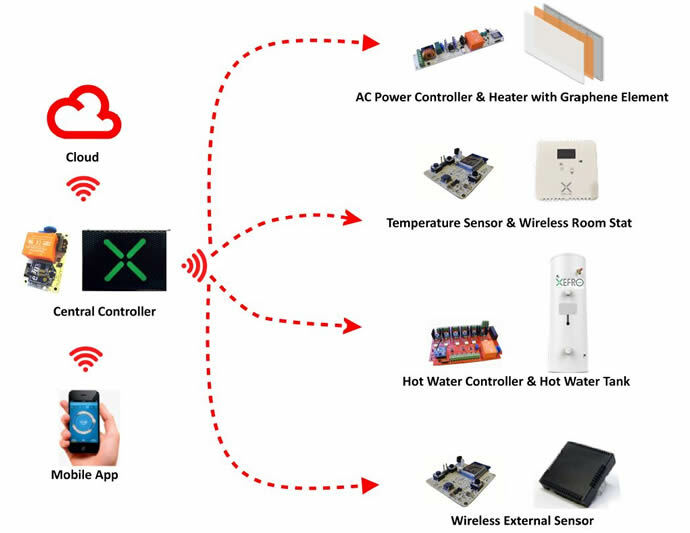 The Xefro heating system will consist of a Central Heating Controller which will communicate via RF signals to a Hot Water Controller and to the various zones. Each zone consists of at least one heater and AC Power Controller, and separate Temperature sensors. The user interface for the entire system will be via a mobile app. All of the electronics for the system have been designed and produced entirely at ECL’s Glasgow-based facility. Graphene is being hailed as the latest wonder material with potential applications across a wide spectrum of industry. It was discovered in the early 2000s and it has huge potential applications in military, medical etc. Broom continued: “It’s not just strong, it’s flexible as well. Current technology in touchscreens for example, means they are very brittle - a hard knock would shatter them. Not far away will be touchscreens using graphene where you’ll be able to hit it with a sledge hammer and it won’t break, so there is huge commercial potential for its use.